The AT91SAM7S-EK evaluation board is designed for evaluating the AT91SAM7S range of 32-bit ARM7 microcontrollers from Atmel. It is priced at around $120 US. The board comes packaged in a cardboard box with top and bottom sponge inserts. The board is protected by a static shielding bag. A USB cable and DVD is included in the box. A RS-232 cable will be needed if the RS-232 ports of the board are to be used. The board has two 9-pin DB9 male connectors connected to two of the AT91SAM7S256 serial ports. For a Windows platform, there are several commercial C compiler tools available. Most of the tools will have evaluation versions that are usually restricted by code size that will compile. There are also open source toolchains available for Windows and Linux. Soldered on the board is a AT91SAM7S256 microcontroller packaged in a 64-pin LQFP (Low-profile Quad Flat Pack). This microcontroller contains a ARM7 core (ARM7TDMI) that can run ARM and Thumb instruction sets. 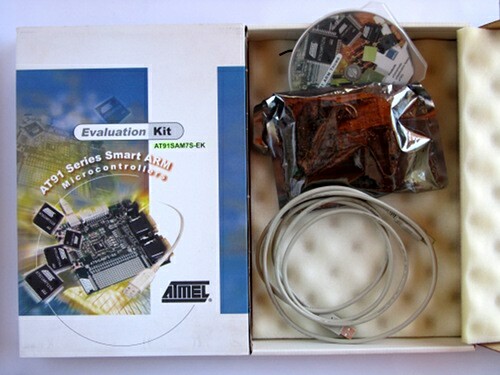 This microcontroller is part of the AT91SAM7S series of ARM7 microcontrollers from Atmel. It is a stand alone microcontroller with no external bus. The AT91SAM7SE microcontroller range are AT91SAM7S microcontrollers that have an external bus. There are two members of the AT91SAM7S series that do not contain a USB port (the AT91SAM7S32 and AT91SAM7S16). The board is configured to use the SAM-BA boot loader program that is embedded in the AT91SAM7S microcontroller. This means that the board can be programmed (i.e. the microcontroller Flash memory) without the need of an external programming device. All that is needed is a program from Atmel that runs on the PC. The board can then be programmed through the USB port or serial port. The board has four user programmable LEDs and four user programmable switches. It also has a reset switch. Four of the eight analog pins are buffered and available on PCB pads. Two serial ports are connected to DB9 connectors through RS-232 level converter ICs. The board is powered by USB but can be powered externally through a connector. The AT91SAM7S256 has a 18.432MHz crystal connected to it which allows it to operate at 48MHz. The USB port is usable only when the microcontroller is running at 48MHz. 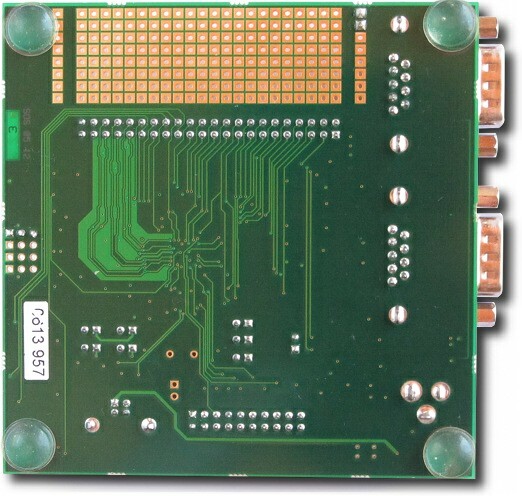 The board has a number of connections on the top PCB layer that can be broken to disconnect interfaced peripherals – e.g. to disconnect the LEDs if needed, the pins used by the LEDs will then be dedicated to the pin header. The PCB solder bridges can be reconnected by soldering them closed. Jumper links on the board can be removed allowing an ammeter to be connected if current consumption of the microcontroller needs to be measured. Individual jumpers are available so that different power areas within the microcontroller can be measured e.g. core, Flash memory, I/O current consumption can all be measured separately. Plugging the board into the USB port of a PC will provide power to the whole board. It is also possible to power the board with an external 7V to 12V power supply connected to the 2.1mm power socket. New programs can be loaded to the board via USB using SAM-BA or through the JTAG port using a JTAG emulator. Several different programs can be run on the board before needing to interface external hardware. I/O capabilities can be tested using the on board LEDs and switches. Potentiometers can be connected directly to the buffered ADC pads on the board for evaluating the ADC. Each ADC input has 3 pads – 3.3V, ADC input and 0V for easy connection of a potentiometer. External devices can be interfaced to the board using the 44 pin header. A IDC connector and ribbon cable can be used to connect to an external prototype board. The more common 50 pin IDC female connector can be used instead of a 44 pin connector, leaving the unused holes open. There are four GND connections on the board for easy oscilloscope ground connection. The board can be programmed using either SAM-BA or a JTAG ICE such as the Atmel SAM-ICE or other JTAG emulator from one of the many other vendors. 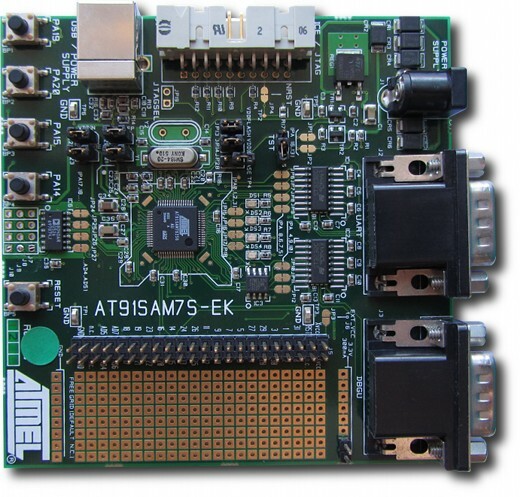 The AT91SAM7S-EK is a well made evaluation board for evaluating the AT91SAM7S range of ARM7 microcontrollers. It easy easy to program through the USB port without the need for external tools. Debugging capabilities can be added by using one of the many JTAG emulators available.